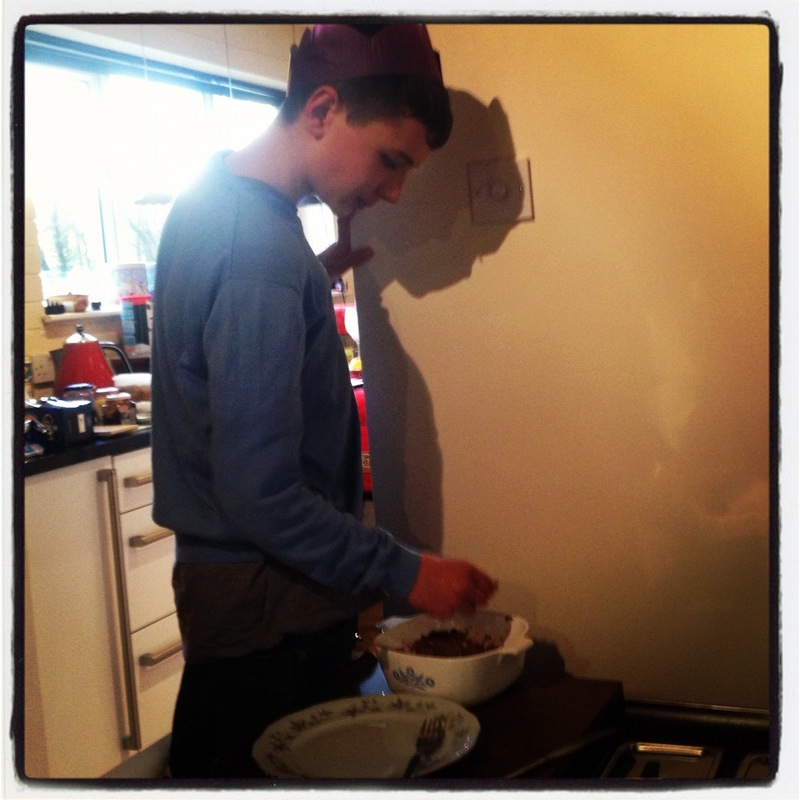 It is Louis’ birthday today so I thought he could provide the photographs today. Google came up trumps and I managed to find some Merlin figures. His grandparents asked me to buy him an Arthur outfit and again google was my friend. 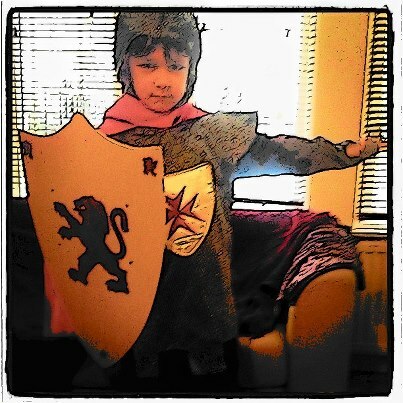 He’s been happily playing at knights all day, and we haven’t even had that many dead-Arthur impressions. In talker-related news we’re off to a good start. Today I was discussing with my Mum and Richard when the 12th night is – for the all important tree-down operation. We couldn’t work out whether the first night is the 25th, or whether you start counting from Boxing day. Anyway, mid discussion Archie appeared Christmas gone Sunday. I told him the Christmas tree is going to come down tomorrow rather than Sunday, a day when he has respite at Downham House. He listened then said Christmas tree gone Saturday after Downham. It is a small sentence but actually pretty amazing. He understood that the Christmas tree has to come down but more than that, told us he wants to be there to see it come down. Left without instruction from Archie we would probably have taken the tree down while he was at respite which may or may not have caused grief on arrival home. Only the parent of a severely autistic child can truly understand the relief at having probably avoided a meltdown…..
Forgive me, it’s a stupid title I know, but I remain overjoyed that this Christmas period has continued to be defined by the death of a fictional TV character, rather than anything autism related and decided to celebrate that once more. For anyone concerned, Louis has made a full recovery from the shock of Arthur’s death and has taken to amusing himself doing ‘dead Arthur’ impressions, rolling his eyes back complete with a slither of white eye showing. Oh yes, as he said, he’s so sensitive. So it really has been calm here; unlike the sea. We’ve had some painful walks along the beach where the sand has been whipping across our faces. We did have one hairy moment five minutes after the photo below was taken when Archie ended up cut off by the tide, marooned on a small circle of sand . I wasn’t too worried about him, he was risking a soaking rather than anything more dangerous, but I was very worried about the five thousand pound (plus) of talker hung around his neck and dangling over the sea. I moved fast, very fast. 2012 has been a great year for Archie, he’s made enormous progress in so many areas and we remain incredibly grateful to the anonymous donor. Now, with Christmas complete, and being December the 31st it seemed a good time to think back about what I have learned this year, the first full year of talker use. 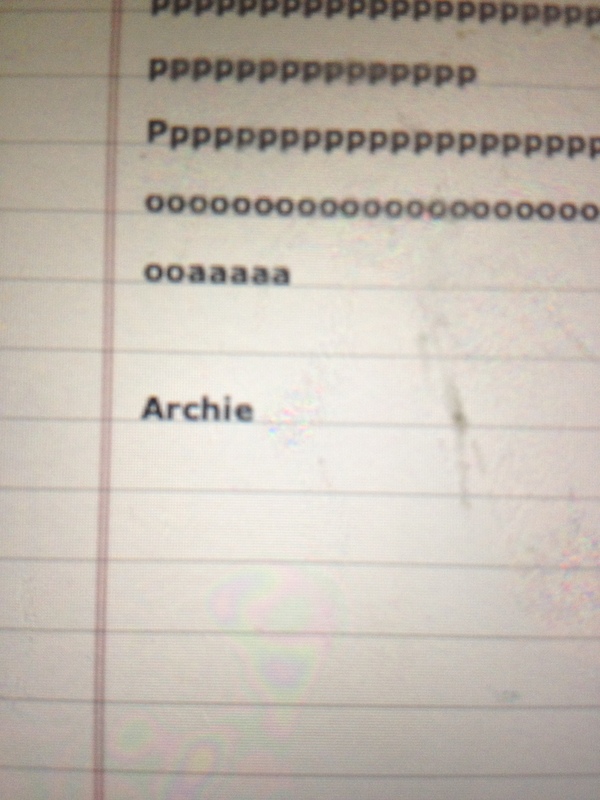 Archie’s language is not intact. At least I don’t think so. I know some children who are non-verbal have found a communication method such as typing and revealed themselves to have pretty much intact language. This is not the case for Archie. Although now he is an active user of language it is developing at great speed, rather like a toddler going through a language explosion. In this year we have moved from a preferred use of one word; e.g. black to mean black car, or granddad’s car, to fairly routine use of longer phrases e.g. granddad black car handbrake up stop. His language development seems very similar to Lucy Blackman’s. She too started aged 13, with AAC. The talker can be used as a tool for humour. Archie has always had a wicked sense of humour, some of which can be incredibly annoying (e.g. taking people’s glasses off & sniffing people). With the talker he can enjoy his joke, by telling us he is going to do something naughty (such as take his head teacher’s glasses off) without having to actually go through and do it. Well sometimes. He had my glasses off about an hour ago, I’ll be back in contacts tomorrow. Archie has his own way of saying things. His use of ‘not’ at the end of a sentence continues and seems pretty much part of him. School tomorrow not. Sniffing Tom Daley not. DEFINITELY not that one (at which stage Archie falls about laughing his leg off). Better communication leads to less frustration and a calmer Archie. a.k.a stating the bleeding obvious. Obviously being severely autistic Archie has his difficult moments (he found the long unstructured summer holidays hard), but the talker really has cut down on a lot of shouty moments. He doesn’t have to shout with frustration now because we can easily understand him. The talker allows Archie to chill out and chew the fat with the rest of the family. Ha! I couldn’t think how else to word this, but staying with the Tom Daley theme I discussed this during the Olympics. The talker has really encouraged a blossoming relationship between Archie and his brothers. Something I wrote about recently. Surfing really does make a difference. This year Plymouth City Council funded some sessions for the kids attending Archie’s respite centre. These were a huge success; videos here; here and here. Archie surfing even ended up on the BBC website. Big waves are the best waves. I have always known that Archie prefers to be out in a decent swell than in flat conditions, but this year he’s been able to make that very clear big waves good. Yes indeed. And so what are we hoping for in 2013? I don’t really spend much time making Archie wish lists these days. He’s happy and progressing faster than he ever has before and I prefer to see where we end up. If I were to predict an area where we might see some real progress this year it would be in literacy. Yesterday he did type his name on the iPad (with help) and I know he is now actually holding a pen and copying letters at school. He is also starting to read, using the talker to read aloud words he is given. So 2013 will no doubt involve more language and more surfing. Definitely more surfing as Archie is already asking when the next session will be. Winter doesn’t stop him. In other news 2013 is going to be the year where I start to work on a film, in part inspired by Archie. I have been lucky enough to work with a fabulous writer and director, Ruth Platt-Stavrik and we think we have pulled together a really very special script. As Ruth explains in a blogpost that may well be the easy bit. What’s life without a challenge? Happy new year to everyone. I hope 2013 is a good one. Remember that year when Archie screamed at the microwave all day and I was 40 weeks pregnant with Louis and ended up with such high blood pressure I had to go up to the hospital to be given cups of tea until it dropped. Remember that Christmas when we bought that sodding helicopter thing and it took 30 minutes to charge for 2 minutes flight time and Archie almost launched himself through the window with frustration and we had to lose it in the bottom of the bin. Remember all those years when Archie was only eating 5 items of food and we had to cook gluten free pizza as well as turkey. 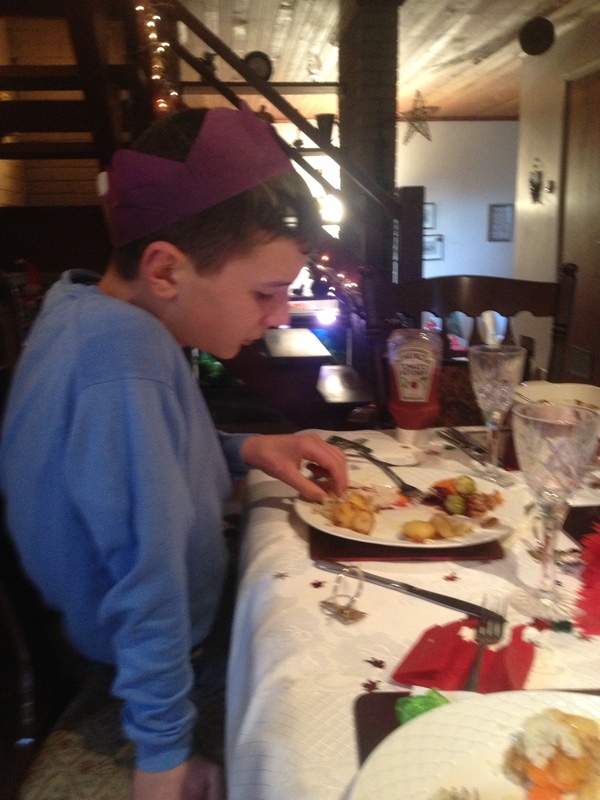 So yes, fond memories and all that, but over the years Christmas really has come to mean autism related stress. We’d be happy with a low key Christmas but Joseph and Louis want turkey and trimmings and presents. And more presents. 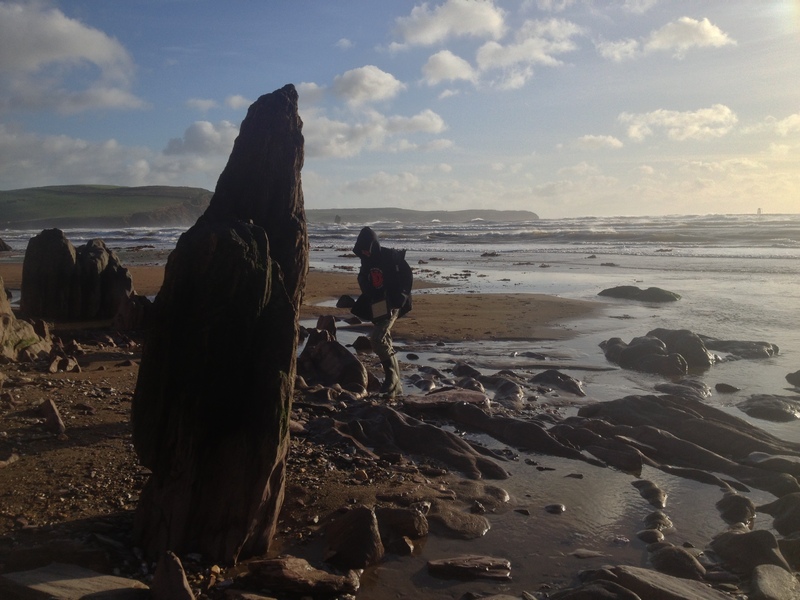 So this year I started Christmas on Sunday 23rd with a surf. I figured a decent surf might chill Archie out a bit to get him through the next few days. I was a bit dubious as we were heading out to Bigbury; the surf was huge – I think probably bigger than anything he’s been in before and it was all looking pretty grotty. It was too big for me really, and anyway I was hungover, so stayed near where the waves were breaking and tried not to get too mashed in the white water. Archie and Harry looked spectacular. Harry had taken Archie out on an 11 or 12 foot board and they kept heading out the back. Harry was able to slot the board into the massive breaking waves and had the Archie end dangling out of the wave with Archie kneeling above thin air. It really was an example of how skilful the surfers are and dog walkers were stopping on the beach to watch, pointing at the pair of them. A good start and on the way home Archie used the talker to tell me big waves and yes surfing soon. Christmas Eve we did the annual carol service with Joe then settled down to watch the final ever Melin. Over the last few series Merlin has become a part-family Saturday evening ritual. Joseph, eleven going on fifteen usually spends his time playing Minecraft and shouting ‘grab a diamond sword’ to his friends on Skype in the room next door, but Richard, Louis and I always watch it together. Archie tends to wander in and out watching YouTube or google mapping on the iPad. He was pretty relaxed this week so the emotional finale wasn’t interrupted all that much by Archie appearing iPad in one hand, talker in the other. Granny grandad handbrake up different day doesn’t really add to dark ages bromance. It was a great final episode, although we were all somewhat gutted that Arthur died, and Louis announced it was his ‘worst Christmas present’. More on why it came to represent Christmas 2012 later. And so onto Christmas day. I stopped buying Archie loads of presents a few years ago. He never opened any – we’d still be finding wrapped presents in the new year, and the whole present unwrapping thing seemed to stress him out. 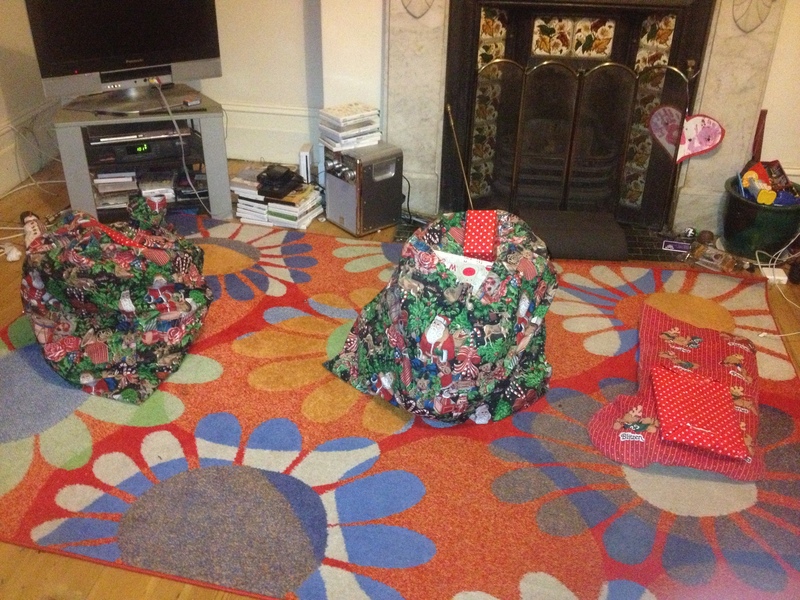 We’d do most of the unwrapping, but if he wasn’t interested once the gift was revealed he would drop it and walk away. I always said you needed no ego giving a present to Archie. We had one very successful year when I bought him a book of photos of Plymouth and not much else and so we learned to think small. He never seems that bothered by the difference in stocking sizes (although I should add the one wrapped stocking present of his was an iPad so he really didn’t miss out this year). 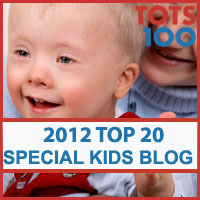 2012 has been a year of firsts, and Christmas morning was no different. Archie came downstairs, looked for his stocking and FOR THE FIRST TIME EVER, opened a wrapped present himself with no prompting. He was delighted with the new iPad although seemed less delighted that I hadn’t wrapped the pyjamas or boxer shorts in his stocking. This continued and each call of ‘Archie we’re unwrapping some more presents’ led to a thud of feet and him joining us (ANOTHER FIRST). Truly great stuff. The days of only eating five items of food are long gone and Archie stole my dad’s stuffing and mineswept his brothers’ leftovers. I’m not sure why Archie was so much better placed to cope with the differentness of Christmas this year, but I suspect having his talker voice and for the first time having access to language played its role. And so Christmas day was done. We remarked on how calm it had been and headed home. Archie took himself off to bed soon after and I decided to re-watch Merlin on iPlayer to catch the bits that had been drowned out by handbrake talk. I’d just reached the part where Morgana receives a well deserved forged-in-a-dragon’s-breath sword in the guts when I was joined by Louis and Richard. This is followed by the most important ten minutes of the whole series, Arthur’s death. Arthur had got as far as ‘just just just hold me’ when Louis let out the most enormous scream. ‘MY TUMMY HURTS’. Thinking we’d been noro virused I grabbed a bowl (mother of three, I can magic up a sick bowl faster than Merlin) at which stage he screamed ‘NOOOOO I’M NOT SICK I’M REALLY SAD’. Now admittedly Colin Morgan and Bradley James were acting the death scene really rather well but this was followed by lots of gulping sobs and tears and ‘I can’t believe Arthur is dead and I’m never going to see Merlin again’. The last time I saw him cry like this was when ‘his’ (not really but he thought it was) horse died. Richard gave him a man to man talk about how a great King wants to die in battle (he’s been reading too much Bernard Cornwell) while I necked some more wine. Peace was restored and the boys were shooed to bed. So anyway another first. 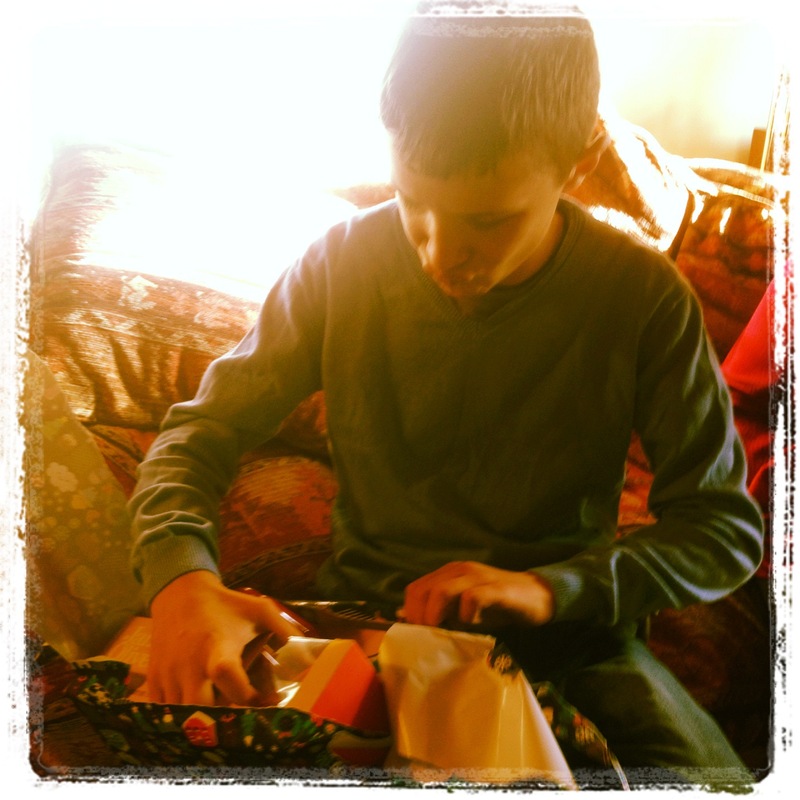 A Christmas that wasn’t remotely defined by anything related to autism. When we remember Christmas 2012 it won’t be the year the microwave led to eight hours of non-stop screaming, or the year the presents weren’t opened, or the year we gave up on decorations because they were just pulled down (they’re ‘wrong’). It’ll be the Christmas Arthur died, which has to be a step towards typical Christmas memories. Maybe one year we can have a huge family row. Louis does seem to have largely recovered from the shock today. I asked him why he had been so upset and he said ‘you know I’m sensitive’. Er what? No, I know he’s noisy and bonkers, but sensitive? Ha. Maybe. 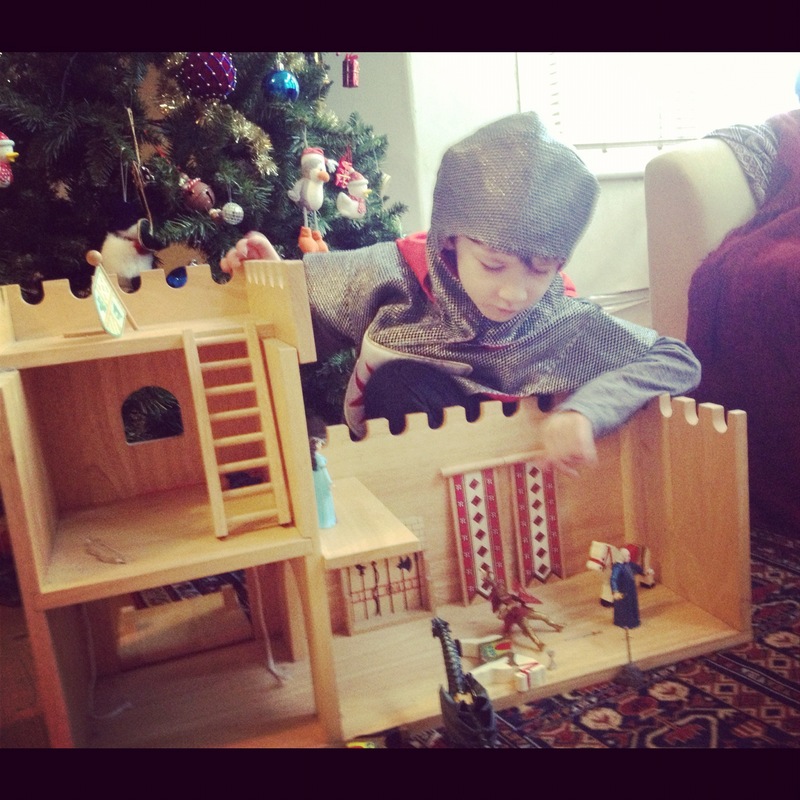 He’s asked for a set of Merlin action figures for his birthday next week. Time to hit google.